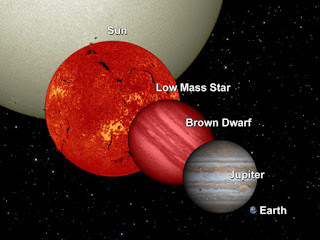 Bill's Movie News and Reviews: "Can Jupiter Ever Become a Star?" “Can Jupiter Ever Become a Star?”, short film by Anton Petrov. 60 masses would make a brown dwarf, which would be smaller in volume but denser. It takes 78 masses to make a red dwarf star. What’s more interesting is to wonder what Jupiter’s hydrogen ocean would “look like”, or, for that matter its layer of metallic hydrogen. Wikipedia attribution link, NASA, p.d.